On November 4, 2008 the economic carnage being wrought by the Global Financial Crisis was an unfolding crisis and the US electorate, desperate for change, elected Barack Obama to deal with the great economic mess. The ‘skinny kid’ rode to the White House on the luck provided by progressed Sun trine progressed Jupiter. The Sun is the planet of politics and Jupiter, the planet of hope and optimism is not only prominent in his chart, it’s his best planet. This high-harmony aspect allowed him to sell his message of hope and win the Presidency. But the Sun in his chart is the weakest planet so the lack of political acumen and authoritative control was always going to be a liability. Now a fortunate progressed aspect can’t make a good politician out of a poor one. It can’t produce talent when talent is lacking, but it can provide the lucky breaks needed to succeed. It can provide supportive environmental conditions and in Obama’s case that was a financial-economic crisis. Luck can help when talent is lacking and with progressed Sun trine progressed Jupiter Obama had an abundance of good-fortune, but on December 7, 2008 when the aspect reached its use-by date he ran out of luck. On January 20, 2009 Barack Obama was sworn in as the 44th-President of the USA and on that day all that changed was the person sitting in the driver’s seat. The US chart didn’t change; the cycle charts didn’t change and the planets in the sky continued in their orbits around the Sun. George W Bush had presided over the 2008 financial crisis. It was the result of reckless lending and unregulated banking and investment practices that he supported. He was born July 6, 1946 at 7.26am EDT — New Haven CT (41N18; 72W55) and Mars in his chart — the planet of recklessness and strife — is in house 2 (money and banks). The Subprime mortgage crisis had already hit in August 2007. At that time progressed Mars (at 17 Libra 13) had moved to form a prominence (conjunction) aspect with birthchart Jupiter — planet of banks and finances — in house 3; and progressed Jupiter (at 26 Libra 07) in house 4 (housing) had moved to form an obstacle (square) aspect with birthchart Saturn, planet of debt and mortgages, in house 12 and cusp ruler of house 8 (debt.) The Mars-Jupiter conjunction reached its peak power and recklessness on November 23, 2008 and the Jupiter-Saturn square was at its peak power and discord on August 2, 2009. But all things considered it was progressed Jupiter conjunction birthchart Neptune in the Aquarian Age chart that was the prime culprit in the Global Financial Crisis. 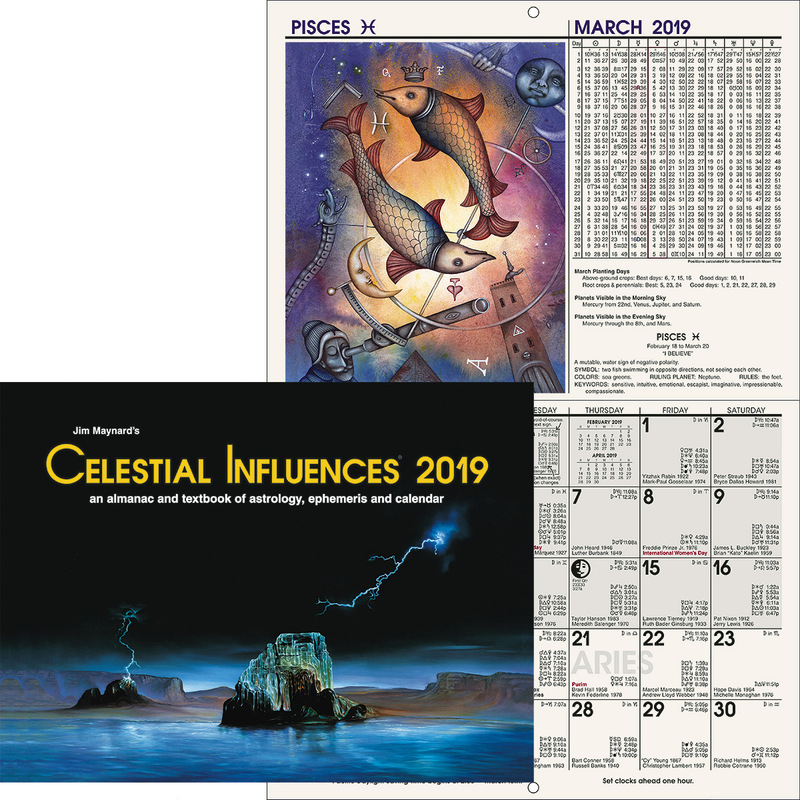 The Age of Aquarius commenced January 19, 1881 at 10.56.42pm GMT and in this chart on June 25, 2007 progressed Jupiter (at 10 Taurus 31) moved to form a prominence (conjunction) aspect with birthchart Neptune (at 11 Taurus 31): And when Neptune — the planet of easy money, Hollywood thinking and magic — promised the world’s bankers (Jupiter) a financial utopia they were razzle-dazzled by the dollar signs. But Neptune is no ordinary magician. As the grand illusionist he can perform the most amazing tricks and during 2008 Neptune abracadabra’d Jupiter’s wealth and made it disappear. The aspect was at its peak power in November 2011 and will hang around till May 2016. And Barack Obama got the aspect’s great big financial mess to clean up. He started out by hitting the US economy with a big spending financial stimulus package and over the next four years his presidency was shaped by economic crisis and financial readjustment. The financial (Jupiter) and economic (Saturn) systems under which we live and operate are very complex. Most of us are far too busy surviving life to study and understand economics. We depend on our politicians, financial gurus, economists and other false gods to provide economic leadership: And limited by their own intelligence, understanding and political ideology these experts dole out facts and make decisions as they see fit. Jupiter is the planet of money, financial matters and capitalism and money makes the world go round. He sources the idea that money makes you happy and that happiness comes from consuming, but self-indulgent consuming only provides transitory feel-good sensations — not deep level contentment. But on a practical level Jupiter knows that money buys food, shelter and clothing and these basics lift people out of poverty. Saturn is the planet of poverty — a state of not having enough — and financial poverty — the one great fear — is the result of not having work and a steady income. Billions of people around the world live in poverty. There is nothing good about poverty and the fear, despair, desolation and feelings of hopelessness it generates are the states of consciousness that Jupiter and his money seek to prevent and escape. Saturn is also the planet of work and unemployment and democratically elected governments are expected to manage their economy in such a way that anyone who wants to work has the opportunity to do so. At the time he won office progressed Mercury in his chart (at 23 Libra 14) in house 8 (taxes and debt) and progressed Mars (at 23 Libra 02) in house 8 had move to form high-discord obstacle (square) aspects with progressed Saturn (at 23 Capricorn 16R) in house 12 . Saturn is the planet of adversity, struggle and unemployment. The aspects were at their peak power and discord on November 11, 2008 and March 3, 2009 and the discord didn’t seem to adversely influence his election campaign. Progressed Mercury in house 8 then moved to form an obstacle (square) aspect with birthchart Saturn in house 12 — perfect November 15, 2010: And with Saturn in the sky forming high-discord opposition aspects with Uranus during 2009-10 this astral earthquake also contributed to the economic calamity. The two planets formed the opposition aspect five times — November 4, 2008, February 5, 2009, September 15, 2009, April 26, 2010 and July 26, 2010 — and the economic crisis continued unabated. In October 2010 progressed Mars (at 24 Libra 20) in house 8 moved to form an obstacle (square) aspect with birthchart Saturn — perfect April 6, 2012: And this non-stop stimulation to Saturn indicated the tremendous economic struggle he had to deal with. So you might conclude he didn’t have a hope. Yet in the midst of all this Saturn discord hope arrived when progressed Sun (at 29 Virgo 52) in house 8 (debt and death) and ruler of house 6 (work) moved to form a luck (trine) aspect with birthchart Jupiter in house 12 (relief and places of confinement), but the aspect didn’t deliver the financial benefits it promised. The Sun-Jupiter trine aspect in Obama’s chart was perfect July 11, 2011 and in the US chart in March 2010 progressed Sun (at 4 Pisces 48) in house 10 (business) moved to form a high-harmony luck (trine) aspect) with birthchart Jupiter in house 2 (finances). The aspect was at its peak power and harmony on March 23, 2011. Obama was the only President in living memory to experience a progressed Sun-Jupiter trine aspect whilst in office and for the US and her president to experience the same astrological good-fortune at the same time was an extraordinary coincidence, but there was no obvious financial good-luck. You might conclude that without these aspects the economic and financial mess would have been a whole lot worse; or that Jupiter simply allowed orthodox religion to increase its influence on the political agenda. But the evidence indicates that the main event associated with these Sun-Jupiter trine aspects occurred on May 2, 2011 when members of the United States Naval Special Warfare Development Group and CIA operatives (house 12) shot and killed (house 8) public enemy #1 Osama Bin Laden (house 7). In Obama’s chart the Sun is cusp ruler of house 7, the progressed Sun was in house 8, and Jupiter is in house 12. During his first term in office the most active planet in his progressed chart was Mercury in house 8 (the public’s money). It’s the ruler of house 6 (work) and his main topics of conversation (Mercury) were job creation and how best to spend the public’s money. Mars — the planet of strife and conflict — in house 7 (the international stage and war) was also very active and it has been sending non-stop stimulation to the aggressive thought-cell group in his unconscious mind. America was already engaged in the War on Terror when he came to office and he has been able to avoid further conflict although the international stage has become a very dangerous place. In 2009 Obama’s top 5 agenda items were: The banking and financial crisis (Jupiter and houses 2 and 8); the unemployment problem (Saturn and houses 10 and 6); relief, relief work programs and closing Guantanamo Bay (house 12); tax reform, health care and homeowner mortgage relief (house 8); and foreign policy (house 7). Now in 2012 the key election issues are the economy (house 2), unemployment (house 10 and house 6), debt (house 8), taxes (house 8), health care (house 1 and house 6), foreign policy — Iran, Israel, Afghanistan, Syria, The Middle East and Pakistan – (house 7), homeland security (Saturn and house 1), US credit rating (house 10), environment and climate change (Saturn and house 4), poverty (Saturn), illegal immigration (house 9), gun control (Mars) etc. The idealistic voter wants peace, work, health care and a stable economy — no wars, no recession, financial equity and low unemployment. 2012-13: On January 10, 2013 progressed Sun sextile (opportunity) birthchart Mercury is at its peak power and harmony; and on May 3, 2013 progressed Mercury sextile (opportunity) progressed Uranus reaches its peak power and harmony date. In December 2012 progressed Venus (at 2 Virgo 22) in house 7 (the other country) moves to form an obstacle (square) aspect with birthchart Moon in house 4 (housing) — perfect October 14, 2013. And in January 2013 progressed Sun (at 2 Libra 22) in house 8 (the public’s money) moves to form a luck (trine) aspect with birthchart Moon in house 8 (homes and housing) — perfect January 28, 2014. 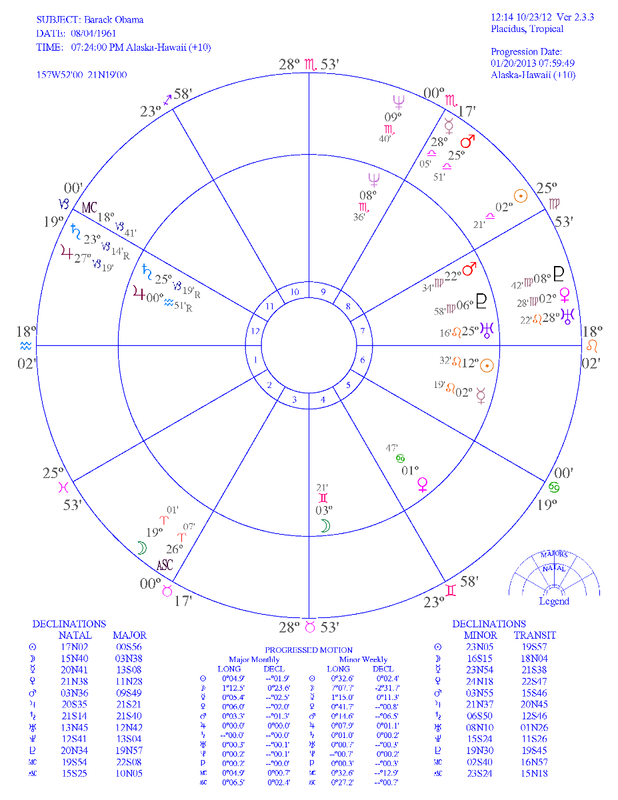 In October 2013 progressed Mars (at 26 Libra 19) in house 8 (debt and taxes) moves to form an obstacle (square) aspect with progressed Jupiter (at 27 Capricorn 19) in house 12 (relief). The aspect reaches its peak power and discord on April 8, 2015. 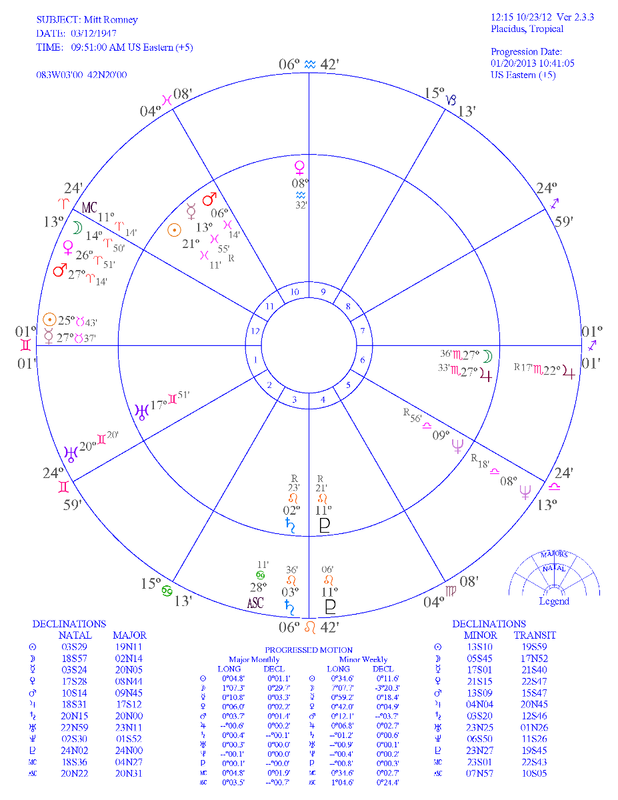 In September 2014 progressed Mercury (at 29 Libra 51) in house 9 (trade) moves to form an obstacle (square) aspect with birthchart Jupiter in house 12 (restrictions). The aspect is at its peak power and discord on September 29, 2015. And in July 2015 progressed Mars (at 27 Libra 23) in house 8 (debt and public funds) moves to form an opportunity (sextile) aspect with progressed Uranus in house 7 (the other country). The aspect is at its peak power in February 2017. In September 2015 progressed Mercury (at 00 Scorpio 47) in house 9 (laws) moves to form a luck (trine) aspect with birthchart Venus in house 5 (the stock market) — perfect September 29, 2016; and in December 2015 progressed Venus (at 5 Virgo 58) in house 7 (foreign policy) moves to form a prominence (conjunction) aspect with birthchart Pluto — perfect October 14, 2016. 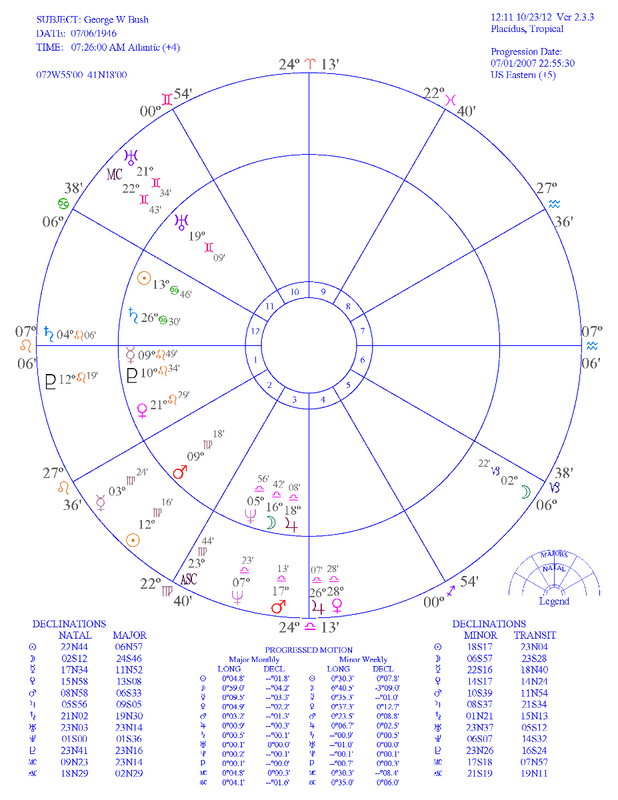 If he’s reelected his Presidency will end with progressed Mercury (at 2 Scorpio) in house 9 forming a square (obstacle) aspect with birthchart Mercury in house 6: And progressed MC (at 22 Capricorn 14) in house 12 forming a conjunction (prominence) aspect with progressed Saturn (at 23 Capricorn 14) planet of work, responsibility and loss. In December 2013 progressed Sun (at 26 Scorpio 33 and 27 Scorpio 36) in house 12 (disappointments) moves to form separation (opposition) aspects with birthchart Jupiter and birthchart Moon in house 6 (work). 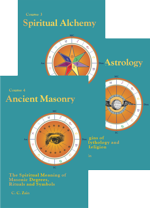 The aspects are at their peak power and discord on December 17, 2014 and January 8, 2015 respectively. In October 2014 progressed Mercury (at 1 Gemini 23) in house 1 (him) moves to form an opportunity (sextile) aspect with birthchart Saturn in house 3 (communications and transport) — perfect March 27, 2015; and in June 2015 progressed Mercury (at 2 Gemini 36) moves to form an opportunity (sextile) aspect with progressed Saturn — perfect November 23, 2015. 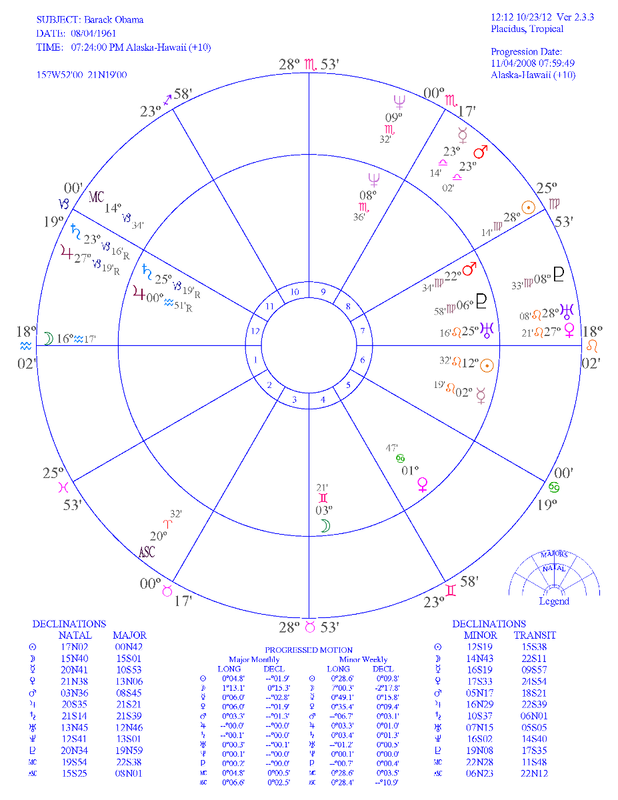 Romney’s chart remains quiet until July 18, 2016 when progressed Mercury (at 5 Gemini 14) in house 1 moves to form an obstacle (square) aspect with birthchart Mars in house 11 (Congress and friends); and on October 25, 2016 progressed Venus (at 1 Taurus 23) in house 12 moves to form an obstacle (square) aspect with birthchart Saturn in house 3. Over the next four years Barack Obama has one conjunction aspect, three fortunate sextile aspects, two very fortunate trine aspects and three high-discord square aspects. And Mitt Romney has one conjunction aspect, two fortunate sextile aspects, one trine aspect — progressed Jupiter trine Sun — and four opposition aspects. 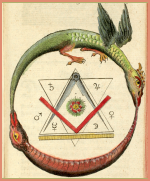 (The weaker aspects and progressed aspects involving the ascendant and Midheaven have been ignored.) So Barack Obama has more opportunities and more luck although progressed Jupiter trine birthchart Sun in Romney’s chart is very high-harmony. But both candidates have high-level discord coming up — big obstacles for Obama and major separations for Romney. And that Uranus-Pluto square aspect in the sky will be around till well into 2015. The economic and financial problems are now getting very hard and you’ve got to decide which of the presidential candidates has the best policy solutions and if their progressed aspects support success. The President and his advisers will have their ingenuity taxed to the limit, but politicians are not noted for their original thinking (Uranus). Following precedent they tend to recycle old solutions so new innovative solutions are rare. In politics the charismatic leader can instigate radical change, but the big political machines (Pluto) are primarily driven by short-term political advantage and maintaining the status-quo.